Background Colors Only Added a Background node to the KelpForest world. Background Images Only Simple Background node with images only. Background Kelp Forest Main Added a Background node to the KelpForest world. Background Selector Select one of four Background nodes to show a time-of-day effect. Background Sequencer Cycle through four Background nodes to show a time-of-day effect. Background Time Of Day Interpolate between Background color arrays to show a gradually changing time-of-day effect. Directional Light An example of the DirectionalLight node showing no shadows on the lit geometry. Fog Kelp Forest Main Added fog to the KelpForest world to simulate the typical weather pattern in June in Monterey, CA. Point Light Two examples of scoped PointLight nodes showing the effects of distance on lit geometry. Faceted IndexedFaceSet is on the left, simple Box on the right. 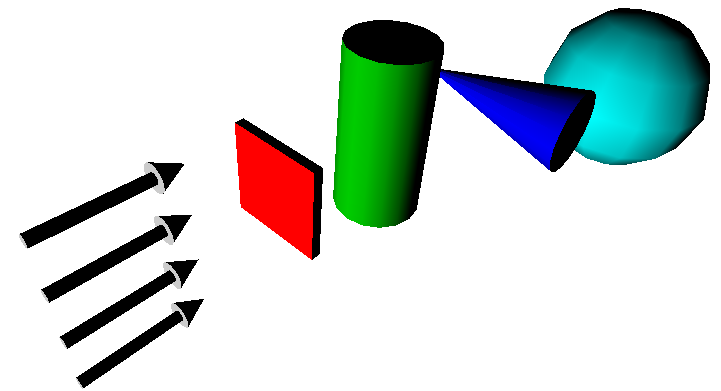 Point Light Color Example of a PointLight node showing the effect of distance on lighting of geometry. Spot Light Visualization Create outline geometry to show SpotLight coverage. Author TODO: use the X3D-Edit SpotLight editor to modify and re-visualize the first SpotLight. Texture Background Simple TextureBackground node with images only. Texture Background Kelp Forest Main Added an image panorama with the Background node to the Kelp Forest world.